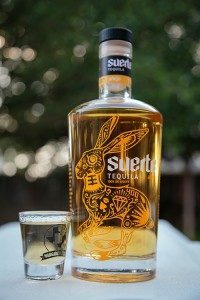 This month’s featured tequila is the anejo offering by Suerte. According to their website, Suerte Anejo Tequila is aged for 24 months in white oak bourbon barrels which is twice as long as the industry standard. The 750ml bottle features an artistic rabbit designed by tattoo artist, Adam Jackson. Within the rabbit are many cleverly placed “lucky” symbols, including a diamond, spade and crown. The artwork is based off of a story in Aztec mythology about Centzon Totochtin, a group of deities who meet for frequent parties and the gods of drunkenness. Sounds like a perfect fit to us. The aroma is cooked agave, spice and slight wood. The taste has a mild sweetness, with vanilla and oak which warms you up as it goes down. 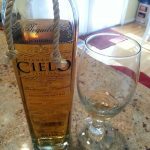 This tequila is priced around $55 to $63 which is what you would expect to pay for a decent anejo. We have tried the blanco and reposado (reviews possibly later) and thought this was an excellent compliment to their line of tequilas. 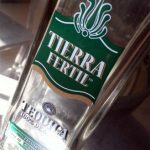 Their website (http://drinksuerte.com) offers several different drinks that can be made with this tasty liquid. Suerte Anejo is an excellent sipping tequila and prefer it straight out of a tequila snifter.